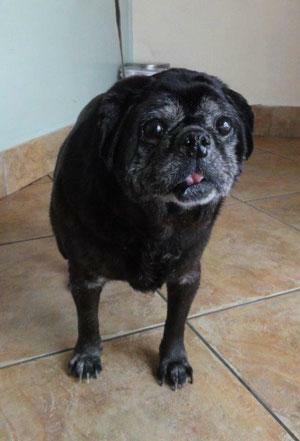 Chester was a CPR Permanent Foster cared for by a wonderful, loving foster home. Chester recently crossed the Rainbow Bridge. Thank you, Sheila for taking such good care of this handsome, special boy. My name is Chester and I am the definition of an “oldie but goodie”! At 12 years of age, I find myself homeless and in need of a new family to appreciate the love I still have in my heart, hopefully, for years to come. My story is a sad one…. I was brought into the animal shelter by a lady that found me on the side of the road. She witnessed someone pull over and push me out the front seat. I know – Shame On Them! My blessing was that the animal control officer called CPR and they came right over to claim me. I don’t want to think about what would have happened had it not been for the rescue angels. I got lots of things to fix up like yucky teeth, and a hole from my tooth to my nasal passages (fistula). My peepers are not too good, but I do get around OK. I know you could probably look at other puggies that don’t need so much fixing, but you would REALLY be a true angel if you decided to make my last few years the best of my life!! CPR will take care of all my medical problems so don’t even worry about them. My foster mom says i am a “luv pug”. All I want to do is spend time with you. I like to sneak up on my foster mom when she is cooking or washing dishes and give her little kisses on her ankles. I am potty trained and let you know when I want to go outside. I get along good with my foster bro.